The Trespasser by Tana French- I know I just got this one, but I can't wait to see what happens with Antoinette and Stephen. I really enjoyed getting to know them in the The Secret Place, and was excited to see they get another book. Tana French usually introduces the lead of her in a previous novel, as a minor character. Like, in Faithful Place, we meet Stephen Moran who is the lead in The Secret Place. He's also in The Trespasser, but I'm guessing Antoinette Conway will be taking the lead in this one, she was a supporting character in Secret Place. She writes such real, flawed, but human characters, I can hardly stand it. Part of me wants to save this one for the middle of winter, but part of me just can't wait. The World's Last Night and Other Essays by C.S. Lewis- C.S. Lewis is my favorite theologian. He can write deep, symbolic fiction, and he can write essays that feel like you're having a conversation. There's been a lot going on lately, and a little Lewis is just what the doctor ordered. The Shining Girls by Lauren Beukes- I let one of my friends borrow this one and she said it was good but the ending wasn't quite up to par. So, I don't really know what to expect, but time traveling and a serial killer is enough for me to give it a try. I just hope it's not too gory. The Mindfulness Habit by Kate Sciandra- I'm drawn to this one because it's supposed to help you increase productivity. Yes please! And, it's nice and slim so I think it's going to be to the point. Sometimes I feel like self help books give you what you need to know in the first couple chapters but then needlessly drag on for another 100 pages. So, this one is small enough that shouldn't be the case. 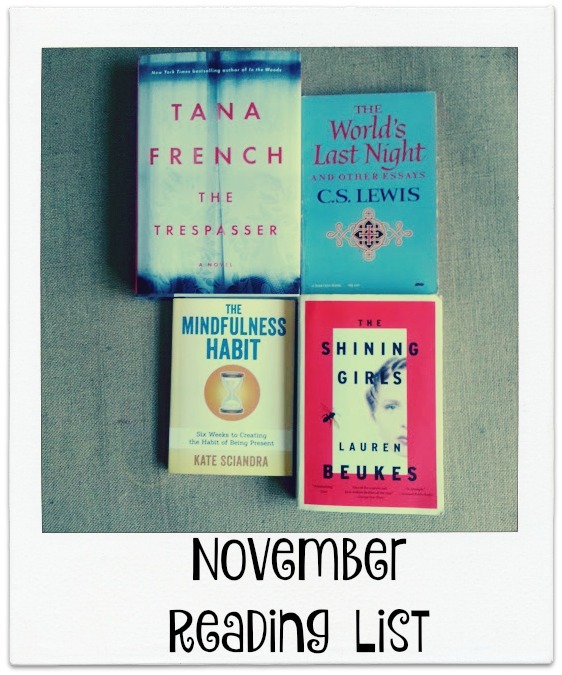 So what are you hoping to read in November? I love CS Lewis' works as well. I have not read this one, anxious to see your review.